There is a saying for the old..look at their nails and footwear to know how they are taken care of. From what I hear, read and see,those who are in their second childhood are not taken care of. As they grow old,their mental and physical capacity deteriorates, leaving them at the mercy of their off springs. All they require is some one to pay attention to their small needs, spoken to for a few minutes, and whether their advice is heeded or not at least including them in their conversation would bring them to recollect their experience.They become nostalgic.Their solitude life in the mad world make them expect someone to speak to them and make them feel happy and wanted in this world.Just a mere thought of recognizing their existence would do them feel good. They become so dependent and expect someone to come to their help, that too in this electronic world. Our parents never thought about us while bringing us up, they gave their best they would have never imagined being neglected in their second childhood. People keep saying that its a headache to take care of elders , because of their slow nature in grasping, walking, listening which peeves them . Many send money to compensate the void created by their absence but at their stage , they want those who are around them to make them feel that the world is still wanting you and is a better place to lead a life to the fullest. Stand beside your parents because they had a dream with you, they did so much for you. Most important what you are today is only for your parents not anyone else in the world. 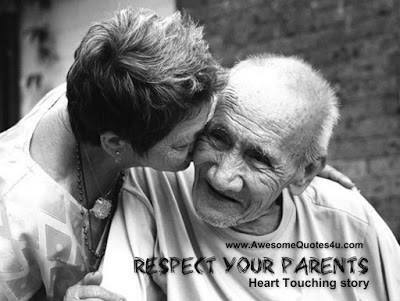 Look your parents with Love and care. sharing what I read recently..